Although colonoscopy is a safe procedure that’s proven to save lives, it’s got a bad reputation because of the discomfort it can cause. But that could change soon. But now, researchers from the National University of Singapore have created a probe that is slimmer than a regular probe and is just as good as getting a look inside the intestines. According to a news release from the university, the endoscopic probe delivers adjustable-focus capabilities in a slimmer package. The researchers’ findings, published in the journal Optics Express, published by The Optical Society, could ultimately facilitate more effective and less painful imaging of internal tissues. The lens system contains two transparent polymer plates, each with one flat surface and one freeform curved surface, the news release said. 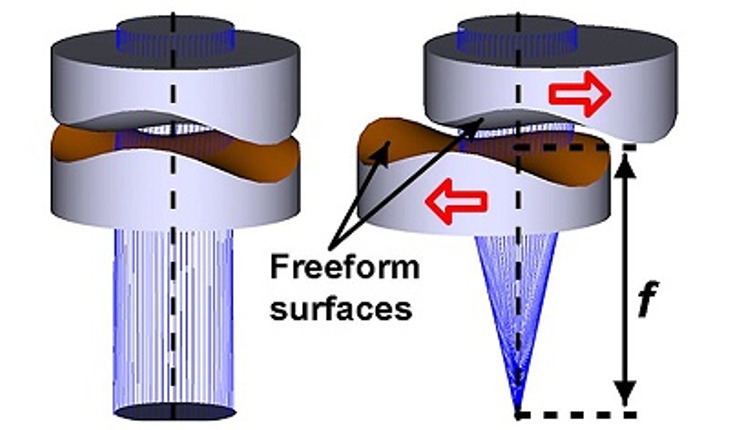 The freeform surfaces are inverses of each other. When the transparent plates are perfectly aligned with the freeform surfaces facing each other, they behave as one unit without any focusing power — any wave phase shift induced by one is cancelled out by the other. However, when they are slightly offset in a sideways direction, they refract light like a traditional lens. Two piezoelectric benders drive these minute shifts in lens placement, controlling the focusing power of the endoscope by changing the degree of displacement. The image is then transmitted to an external camera monitored by a technician. The resulting device is far less bulky than existing high-magnification endoscopes. Although some labs are testing an alternative approach to reducing the size of endoscopes by making them with tunable liquid-crystal lenses, those lenses can be fragile and difficult to handle, according to the research team. Their new design, they said, uses only solid components. “It is the first time, to our knowledge, that a solid electrically-tunable lens is implemented in an endoscopic system for the purpose of focus tuning,” said Guangya Zhou, a researcher at National University Singapore who led the project. Their device is still in the early stages and has not yet been tested in a clinical setting. The next step will be to incorporate multiple tunable lenses into the system so that it has not just adjustable focus, but full-fledged optical zooming capabilities.